Is staying away from Windows and x86 a good thing for a netbook? Even if you've never heard of the Elonex ONEt before, you've probably seen it in a different incarnation. You see, in China there's a gigantic factory pumping out netbooks with mildly varying designs but identical specs: 400MHz CPU, 128MB RAM and 1 or 2GB of flash storage. You'll see it in Maplin as the Minibook, or elsewhere as the Skytone Alpha 400. Elonex offers the ONEt in a trio of colours – black, green and pink – and right from the first time you pick it up, you know that it's tough. The firm frame and thick plastic make the ONEt feel satisfyingly robust. It's the smallest netbooks on the market, just a smidgen narrower than the Toshiba NB100-11R, and this becomes a problem with the keyboard (especially the tiny cursor keys) and the nanoscopic trackpad. To conserve space, the latter has buttons on each side à la the Acer Aspire One A110. On the right-hand side is a pair of USB ports, while the left-hand side holds an SD card slot, headphone jack and microphone input port. Round the back is another USB port, an Ethernet port and the power socket – in all, not a bad range of pluggable holes given the low price. So far, so good-ish: it's tough and well equipped. What about the software? Well, the ONEt is unique in this roundup in that it doesn't have an x86-compatible CPU. 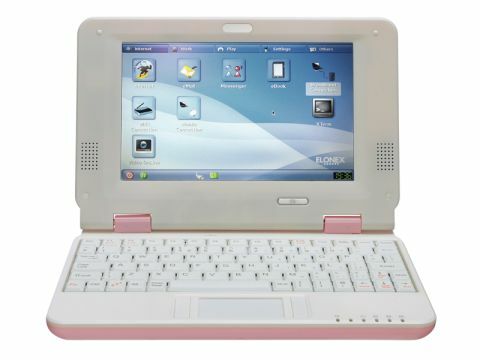 While all other netbooks are theoretically capable of running any PC OS from Windows 3.1 to Fedora 11, the ONEt and its brethren use a CPU based on the XBurst architecture. XBurst is a variant of MIPS, the CPU family famously used by SGI in its beefy-looking Indy and Octane workstations. The tabbed interface provides access to AbiWord, Gnumeric, four games (including Pengupop) and a locked-down file manager that makes sure you don't touch anything outside your home directory. There's also a media player that helpfully flashes up the max recommended specs when you start it (350x288 resolution at 128kbps). Power management is almost entirely absent – there's just a "bettery" meter, and the screen backlight doesn't switch off when you close the lid. There are a few add-ons at www.littlelinuxlaptop.com, along with a community-built distro called 3MX, which is pretty cool in a geeky kind of way, but you'll still only want to run Dillo for web browsing. Still, 3MX is proper Linux and gives you a sense of control back. Overall, the ONEt is sorely insufficient in the "mobile lifestyle" category; it's really awkward to use for web browsing. If Elonex dropped the price to £69 and crammed it with education software such as GCompris and KGeography, it'd be perfect for kids. But unless you've got a hankering to play around with a portable MIPS box, it's simply far too underpowered and not good value.